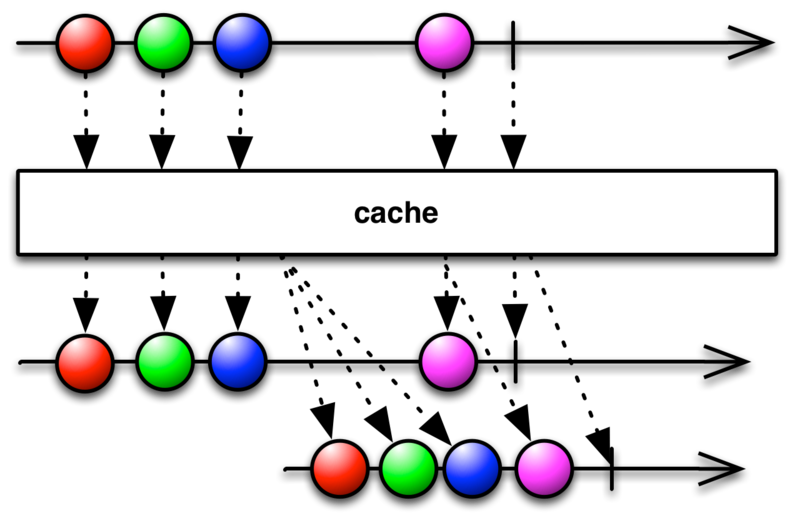 The Single class implements the Reactive Pattern for a single value response. See Observable for the implementation of the Reactive Pattern for a stream or vector of values. Like an Observable, a Single is lazy, can be either "hot" or "cold", synchronous or asynchronous. For more information see the ReactiveX documentation. Invoked when Single.execute is called. Convenience type that allows a function to fluently transform a Single into another Single via compose(rx.Single.Transformer<? super T, ? extends R>). 1.2.1: Not recommended, use Single(OnSubscribe) to avoid wrapping and conversion between the Observable and Single protocols. Creates a Single with a Function to execute when it is subscribed to (executed). Returns a Single that subscribes to this Single lazily, caches its success or error event and replays it to all the downstream subscribers. Casts the success value of the current Single into the target type or signals a ClassCastException if not compatible. Transform a Single by applying a particular Transformer function to it. Returns an Observable that emits the items emitted by two Singles, one after the other. Returns an Observable that emits the items emitted by three Singles, one after the other. Returns an Observable that emits the items emitted by four Singles, one after the other. Returns an Observable that emits the items emitted by five Singles, one after the other. Returns an Observable that emits the items emitted by six Singles, one after the other. Returns an Observable that emits the items emitted by seven Singles, one after the other. Returns an Observable that emits the items emitted by eight Singles, one after the other. Returns an Observable that emits the items emitted by nine Singles, one after the other. Returns an Observable that emits the item emitted by the source Single, then the item emitted by the specified Single. 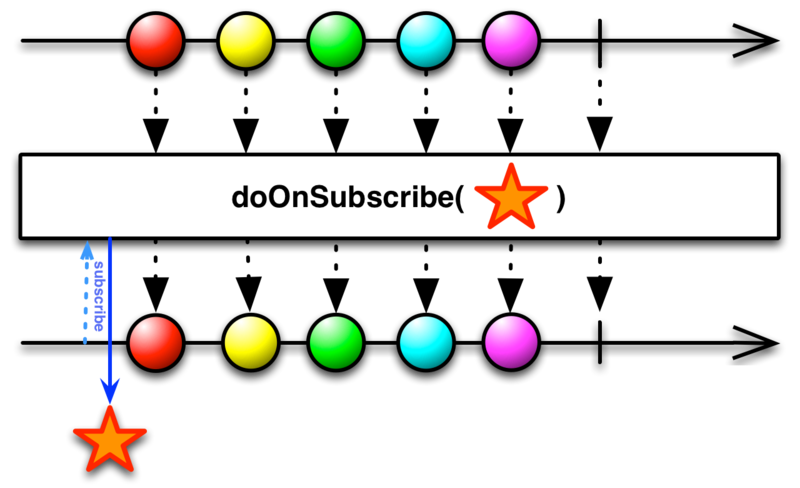 Returns a Single that will execute the specified function when a SingleSubscriber executes it or a Subscriber subscribes to it. Returns a Single that calls a Single factory to create a Single for each new Observer that subscribes. Returns a Single that emits the items emitted by the source Single shifted forward in time by a specified delay. Returns a Single that delays the subscription to this Single until the Observable completes. Registers an Action0 to be called when this Single invokes either SingleSubscriber.onSuccess(Object) onSuccess} or onError. Modifies the source Single so that it invokes an action when it calls onSuccess or onError. Modifies the source Single so that it invokes an action if it calls onError. Modifies the source Single so that it invokes the given action when it is subscribed from its subscribers. Modifies the source Single so that it invokes an action when it calls onSuccess. Modifies the source Single so that it invokes the given action when it is unsubscribed from its subscribers. Returns a Single that invokes a subscriber's onError method when the subscriber subscribes to it. Returns a Single that is based on applying a specified function to the item emitted by the source Single, where that function returns a Single. Returns a Completable that completes based on applying a specified function to the item emitted by the source Completable, where that function returns a Completable. 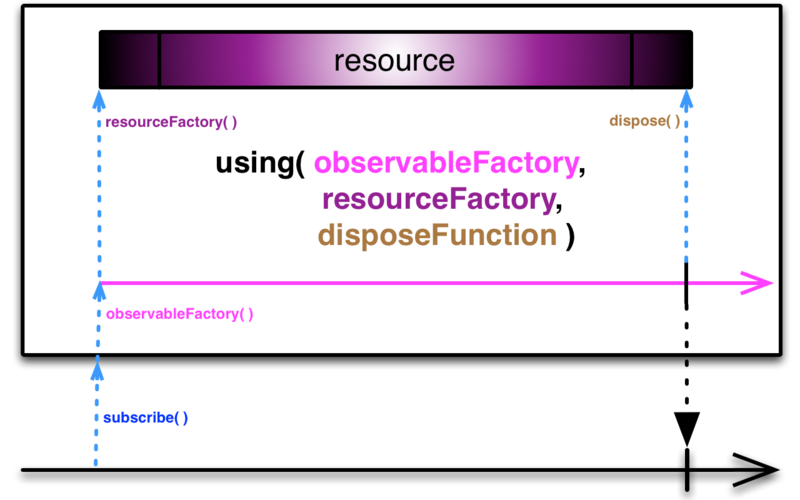 Returns an Observable that emits items based on applying a specified function to the item emitted by the source Observable, where that function returns an Observable. Converts a Future into a Single. Converts a Future into a Single, with a timeout on the Future. Converts a Future, operating on a specified Scheduler, into a Single. Returns a Single that invokes passed function and emits its result for each new Observer that subscribes. Provides an API (in a cold Single) that bridges the Single-reactive world with the callback-based world. Returns a Single that emits a specified item. Lifts a function to the current Single and returns a new Single that when subscribed to will pass the values of the current Single through the Operator function. Returns a Single that applies a specified function to the item emitted by the source Single and emits the result of this function application. Merges all Singles emitted by the Observable and runs them together until the source Observable and all inner Singles complete normally. Merges the Singles emitted by the Observable and runs up to the given number of them together at a time, until the Observable and all inner Singles terminate. Flattens a Single that emits a Single into a single Single that emits the item emitted by the nested Single, without any transformation. Flattens two Singles into a single Observable, without any transformation. Flattens three Singles into a single Observable, without any transformation. Flattens four Singles into a single Observable, without any transformation. Flattens five Singles into a single Observable, without any transformation. Flattens six Singles into a single Observable, without any transformation. Flattens seven Singles into a single Observable, without any transformation. Flattens eight Singles into a single Observable, without any transformation. Flattens nine Singles into a single Observable, without any transformation. 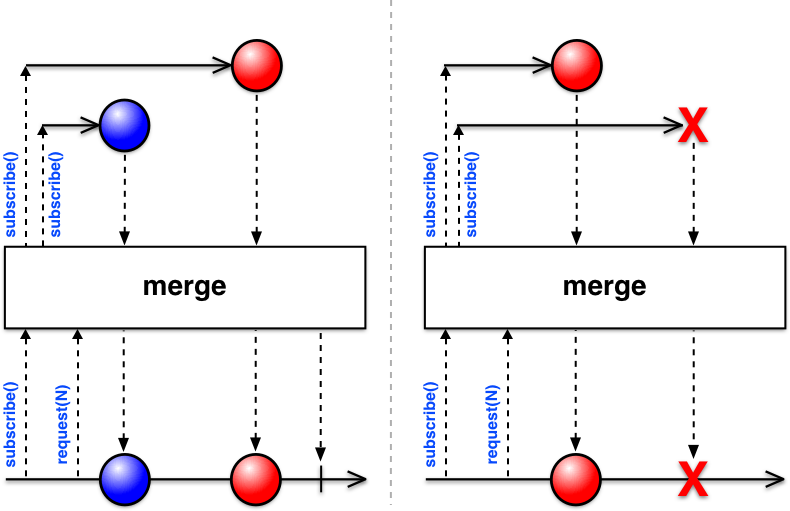 Merges all Singles emitted by the Observable and runs them together, delaying errors from them and the Observable, until the source Observable and all inner Singles complete normally. Merges the Singles emitted by the Observable and runs up to the given number of them together at a time, delaying errors from them and the Observable, until the Observable and all inner Singles terminate. Flattens this and another Single into a single Observable, without any transformation. Modifies a Single to emit its item (or notify of its error) on a specified Scheduler, asynchronously. Instructs a Single to pass control to another Single rather than invoking Observer.onError(Throwable) if it encounters an error. Instructs a Single to emit an item (returned by a specified function) rather than invoking onError if it encounters an error. Returns a Single that mirrors the source Single, resubscribing to it if it calls onError (infinite retry count). Returns a Single that mirrors the source Single, resubscribing to it if it calls onError and the predicate returns true for that specific exception and retry count. Returns a Single that mirrors the source Single, resubscribing to it if it calls onError up to a specified number of retries. Returns a Single that emits the same values as the source Single with the exception of an onError. Subscribes to a Single but ignore its emission or notification. Subscribes to a Single and provides a callback to handle the item it emits. Subscribes to a Single and provides callbacks to handle the item it emits or any error notification it issues. Subscribes an Observer to this single and returns a Subscription that allows unsubscription. Subscribes to a Single and provides a SingleSubscriber that implements functions to handle the item the Single emits or any error notification it issues. Subscribes to a Single and provides a Subscriber that implements functions to handle the item the Single emits or any error notification it issues. Asynchronously subscribes subscribers to this Single on the specified Scheduler. Returns a Single that emits the item emitted by the source Single until a Completable terminates. Returns a Single that emits the item emitted by the source Single until an Observable emits an item. Returns a Single that emits the item emitted by the source Single until a second Single emits an item. Creates an AssertableSubscriber that requests Long.MAX_VALUE and subscribes it to this Observable. Returns a Single that mirrors the source Single but applies a timeout policy for its emitted item. Returns a Single that mirrors the source Single but applies a timeout policy for its emitted item, where this policy is governed on a specified Scheduler. Returns a Single that mirrors the source Single but applies a timeout policy for its emitted item, using a specified Scheduler. Converts a Single into a BlockingSingle (a Single with blocking operators). Returns a Completable that discards result of the Single (similar to Observable.ignoreElements()) and calls onCompleted when this source Single calls onSuccess. Converts this Single into an Observable. Subscribes to a Single and invokes the Single.OnSubscribe function without any contract protection, error handling, unsubscribe, or execution hooks. Constructs a Single that creates a dependent resource object which is disposed of on unsubscription. Constructs a Single that creates a dependent resource object which is disposed of just before termination if you have set disposeEagerly to true and unsubscription does not occur before termination. Returns a Single that emits the result of specified combiner function applied to combination of items emitted, in sequence, by an Iterable of other Singles. Returns a Single that emits the results of a specified combiner function applied to two items emitted by two other Singles. Returns a Single that emits the results of a specified combiner function applied to three items emitted by three other Singles. Returns an Observable that emits the results of a specified combiner function applied to four items emitted by four other Singles. Returns an Observable that emits the results of a specified combiner function applied to five items emitted by five other Singles. Returns an Observable that emits the results of a specified combiner function applied to six items emitted by six other Singles. Returns an Observable that emits the results of a specified combiner function applied to seven items emitted by seven other Singles. Returns an Observable that emits the results of a specified combiner function applied to eight items emitted by eight other Singles. Returns an Observable that emits the results of a specified combiner function applied to nine items emitted by nine other Singles. Returns a Single that emits the result of applying a specified function to the pair of items emitted by the source Single and another specified Single. Note: Use create(OnSubscribe) to create a Single, instead of this constructor, unless you specifically have a need for inheritance. Deprecated. 1.2.1: Not recommended, use Single(OnSubscribe) to avoid wrapping and conversion between the Observable and Single protocols. Write the function you pass to create so that it behaves as a Single: It should invoke the SingleSubscriber onSuccess and/or onError methods appropriately. A well-formed Single must invoke either the SingleSubscriber's onSuccess method exactly once or its onError method exactly once. In other words, this allows chaining TaskExecutors together on a Single for acting on the values within the Single. If the operator you are creating is designed to act on the item emitted by a source Single, use lift. If your operator is designed to transform the source Single as a whole (for instance, by applying a particular set of existing RxJava operators to it) use compose(rx.Single.Transformer<? super T, ? extends R>). lift does not operate by default on a particular Scheduler. This method operates on the Single itself whereas lift(rx.Observable.Operator<? extends R, ? super T>) operates on the Single's Subscribers or Observers. If the operator you are creating is designed to act on the individual item emitted by a Single, use lift(rx.Observable.Operator<? extends R, ? super T>). If your operator is designed to transform the source Single as a whole (for instance, by applying a particular set of existing RxJava operators to it) use compose. cast does not operate by default on a particular Scheduler. 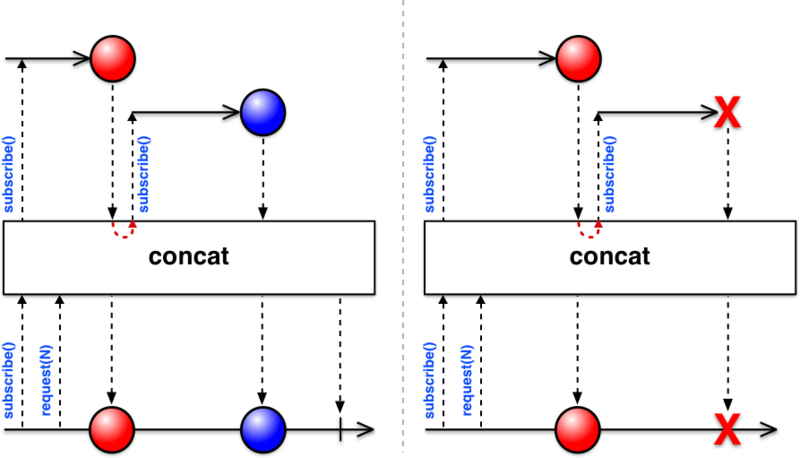 an Observable that emits items emitted by the two source Singles, one after the other. an Observable that emits items emitted by the three source Singles, one after the other. an Observable that emits items emitted by the four source Singles, one after the other. an Observable that emits items emitted by the five source Singles, one after the other. an Observable that emits items emitted by the six source Singles, one after the other. an Observable that emits items emitted by the seven source Singles, one after the other. an Observable that emits items emitted by the eight source Singles, one after the other. an Observable that emits items emitted by the nine source Singles, one after the other. You can convert any object that supports the Future interface into a Single that emits the return value of the Future.get() method of that object, by passing the object into the from method. Important note: This Single is blocking; you cannot unsubscribe from it. from does not operate by default on a particular Scheduler. Allows you to defer execution of passed function until Observer subscribes to the Single. It makes passed function "lazy". Result of the function invocation will be emitted by the Single. T - the type of the item emitted by the Single. func - function which execution should be deferred, it will be invoked when Observer will subscribe to the Single. a Single whose Observers' subscriptions trigger an invocation of the given function. The SingleEmitter allows registering a callback for cancellation/unsubscription of a resource. All of the SingleEmitter's methods are thread-safe and ensure the Single's protocol are held. To convert any object into a Single that emits that object, pass that object into the just method. just does not operate by default on a particular Scheduler. You can combine items emitted by multiple Singles so that they appear as a single Observable, by using the merge method. The operator consumes items from the Observable in an unbounded manner and honors downstream backpressure. The operator consumes at most maxConcurrent items from the Observable and one-by-one after as the inner Singles terminate. The operator ignores downstream backpressure as it doesn't emit items but only the terminal event. flatMapSingle does not operate by default on a particular Scheduler. zip does not operate by default on a particular Scheduler. 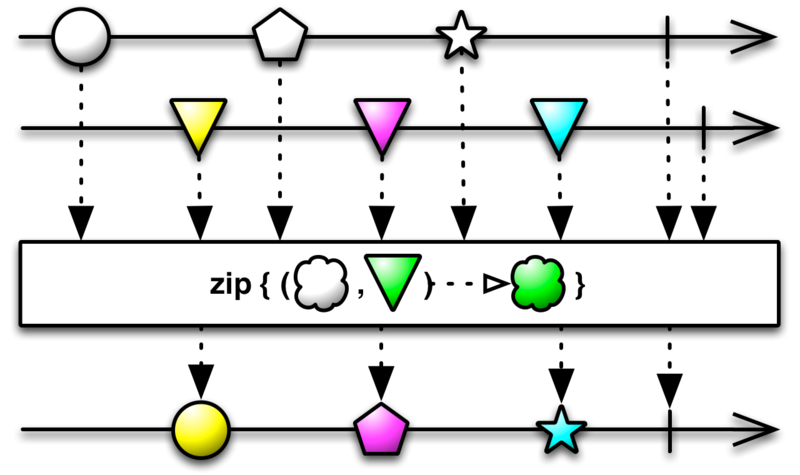 zip applies this function in strict sequence. singles - an Iterable of source Singles. Should not be empty because Single either emits result or error. NoSuchElementException will be emit as error if Iterable will be empty. This is useful when you want a Single to cache its response and you can't control the subscribe/unsubscribe behavior of all the Subscribers. The operator subscribes only when the first downstream subscriber subscribes and maintains a single subscription towards this Single. 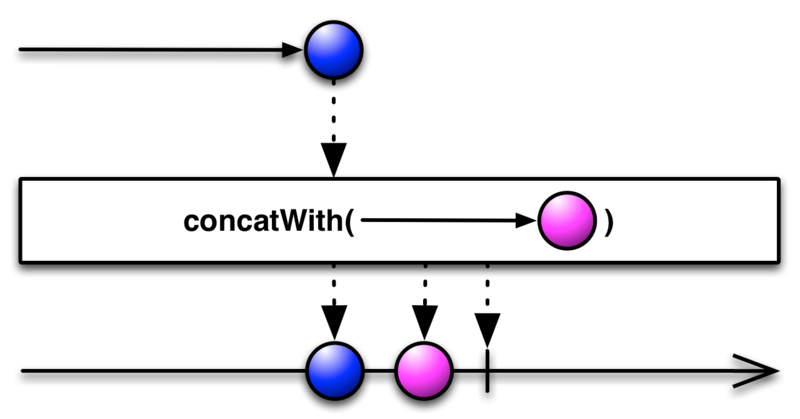 In contrast, the operator family of Observable.replay() that return a ConnectableObservable require an explicit call to ConnectableObservable.connect(). Note: You sacrifice the ability to unsubscribe from the origin when you use the cache Observer so be careful not to use this Observer on Observables that emit an infinite or very large number of items that will use up memory. A possible workaround is to apply `takeUntil` with a predicate or another source before (and perhaps after) the application of cache(). The operator consumes this Single in an unbounded fashion but respects the backpressure of each downstream Subscriber individually. flatMap does not operate by default on a particular Scheduler. flatMapObservable does not operate by default on a particular Scheduler. flatMapCompletable does not operate by default on a particular Scheduler. map does not operate by default on a particular Scheduler. You can combine items emitted by multiple Singles so that they appear as a single Observable, by using the mergeWith method. 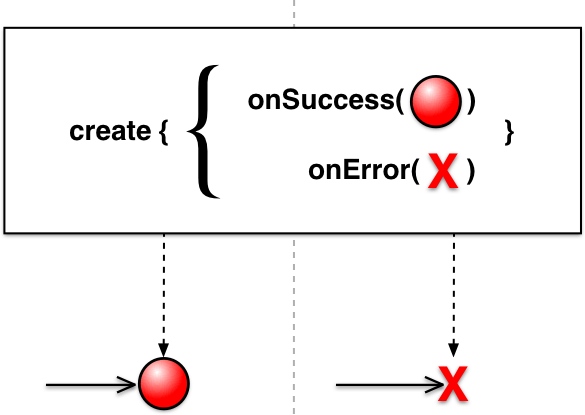 By default, when a Single encounters an error that prevents it from emitting the expected item to its subscriber, the Single invokes its subscriber's Observer.onError(java.lang.Throwable) method, and then quits without invoking any more of its subscriber's methods. The onErrorReturn method changes this behavior. If you pass a function (resumeFunction) to a Single's onErrorReturn method, if the original Single encounters an error, instead of invoking its subscriber's Observer.onError(java.lang.Throwable) method, it will instead emit the return value of resumeFunction. You can use this to prevent errors from propagating or to supply fallback data should errors be encountered. onErrorReturn does not operate by default on a particular Scheduler. By default, when a Single encounters an error that prevents it from emitting the expected item to its Observer, the Single invokes its Observer's onError method, and then quits without invoking any more of its Observer's methods. The onErrorResumeNext method changes this behavior. 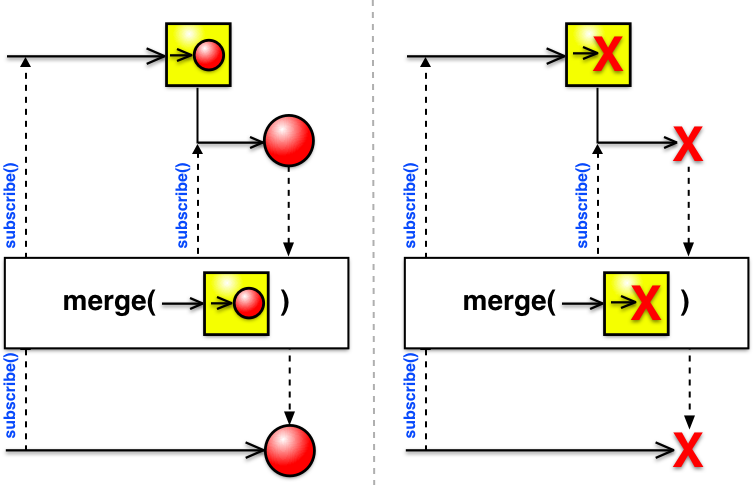 If you pass another Single (resumeSingleInCaseOfError) to a Single's onErrorResumeNext method, if the original Single encounters an error, instead of invoking its Observer's onError method, it will instead relinquish control to resumeSingleInCaseOfError which will invoke the Observer's onNext method if it is able to do so. In such a case, because no Single necessarily invokes onError, the Observer may never know that an error happened. resumeSingleInCaseOfError - a Single that will take control if source Single encounters an error. the original Single, with appropriately modified behavior. By default, when a Single encounters an error that prevents it from emitting the expected item to its Observer, the Single invokes its Observer's onError method, and then quits without invoking any more of its Observer's methods. The onErrorResumeNext method changes this behavior. 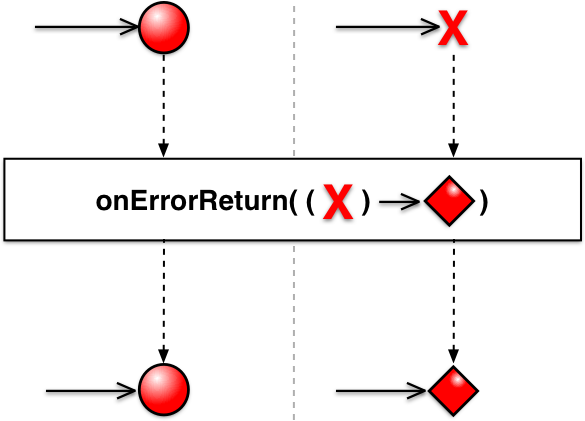 If you pass a function that will return another Single (resumeFunctionInCaseOfError) to a Single's onErrorResumeNext method, if the original Single encounters an error, instead of invoking its Observer's onError method, it will instead relinquish control to resumeSingleInCaseOfError which will invoke the Observer's onNext method if it is able to do so. In such a case, because no Single necessarily invokes onError, the Observer may never know that an error happened. resumeFunctionInCaseOfError - a function that returns a Single that will take control if source Single encounters an error. a Subscription reference can request the Single stop work. Use this only for implementing an Observable.Operator that requires nested subscriptions. For other purposes, use subscribe(Subscriber) which ensures the Rx contract and other functionality. unsafeSubscribe does not operate by default on a particular Scheduler. It stores a reference to the Subscriber in a collection object, such as a List<T> object. It returns a reference to the Subscription interface. This enables Subscribers to unsubscribe, that is, to stop receiving the item or notification before the Single completes. A Single<T> instance is responsible for accepting all subscriptions and notifying all Subscribers. Unless the documentation for a particular Single<T> implementation indicates otherwise, Subscribers should make no assumptions about the order in which multiple Subscribers will receive their notifications. Returns a Single that emits the item emitted by the source Single until a Completable terminates. Upon termination of other, this will emit a CancellationException rather than go to SingleSubscriber.onSuccess(Object). a Single that emits the item emitted by the source Single until such time as other terminates. Returns a Single that emits the item emitted by the source Single until an Observable emits an item. Upon emission of an item from other, this will emit a CancellationException rather than go to SingleSubscriber.onSuccess(Object). Returns a Single that emits the item emitted by the source Single until a second Single emits an item. Upon emission of an item from other, this will emit a CancellationException rather than go to SingleSubscriber.onSuccess(Object). an Observable that emits a single item T.
Returns a Completable that discards result of the Single (similar to Observable.ignoreElements()) and calls onCompleted when this source Single calls onSuccess. Error terminal event is propagated. toCompletable does not operate by default on a particular Scheduler. a Completable that calls onCompleted on it's subscriber when the source Single calls onSuccess. Returns a Single that mirrors the source Single but applies a timeout policy for its emitted item. 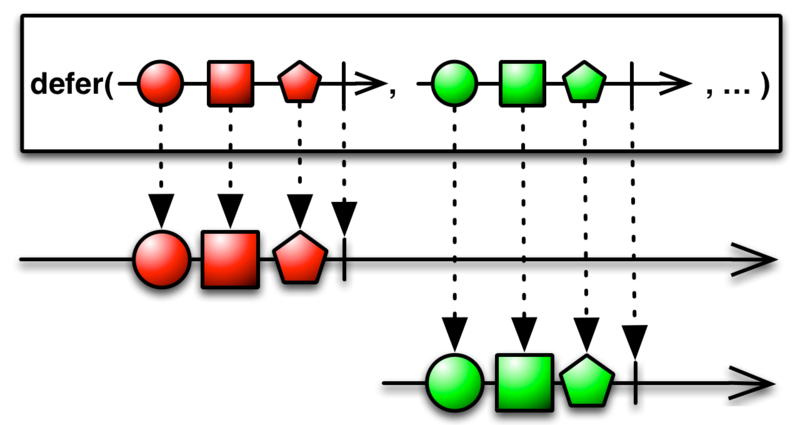 If it is not emitted within the specified timeout duration, the resulting Single terminates and notifies subscribers of a TimeoutException. This version of timeout operates by default on the computation Scheduler. 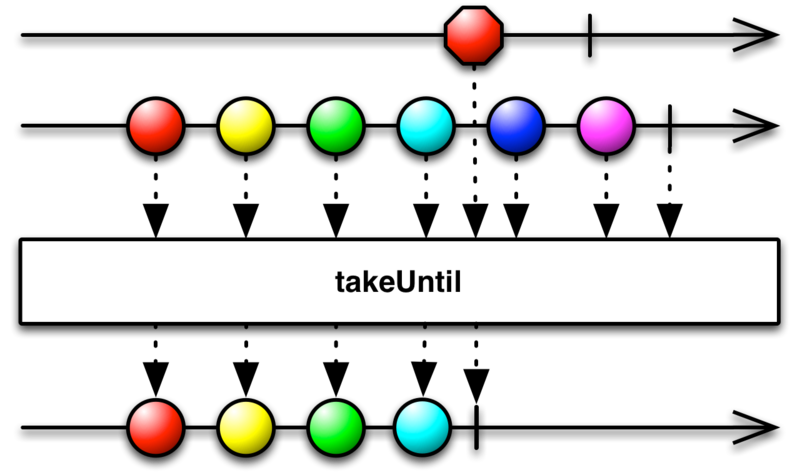 timeUnit - the unit of time that applies to the timeout argument. Returns a Single that mirrors the source Single but applies a timeout policy for its emitted item, where this policy is governed on a specified Scheduler. If the item is not emitted within the specified timeout duration, the resulting Single terminates and notifies subscribers of a TimeoutException. Returns a Single that mirrors the source Single but applies a timeout policy for its emitted item. If it is not emitted within the specified timeout duration, the resulting Single instead mirrors a fallback Single. Returns a Single that mirrors the source Single but applies a timeout policy for its emitted item, using a specified Scheduler. If the item isn't emitted within the specified timeout duration, the resulting Single instead mirrors a fallback Single. toBlocking does not operate by default on a particular Scheduler. a BlockingSingle version of this Single. zipWith does not operate by default on a particular Scheduler. In case the onError action throws, the downstream will receive a composite exception containing the original exception and the exception thrown by onError. doOnEach does not operate by default on a particular Scheduler. onNotification - the action to invoke when the source Single calls onSuccess or onError. doOnSuccess does not operate by default on a particular Scheduler. Modifies the source Single so that it invokes the given action when it is subscribed from its subscribers. Each subscription will result in an invocation of the given action except when the source Single is reference counted, in which case the source Single will invoke the given action for the first subscription. Returns a Single that emits the items emitted by the source Single shifted forward in time by a specified delay. Error notifications from the source Single are not delayed. Returns a Single that emits the items emitted by the source Single shifted forward in time by a specified delay. Error notifications from the source Observable are not delayed. 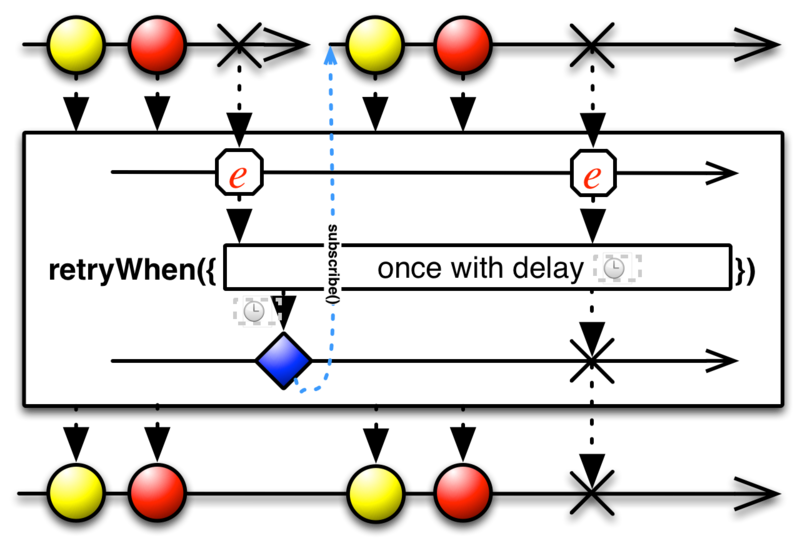 This version of delay operates by default on the computation Scheduler. Returns a Single that calls a Single factory to create a Single for each new Observer that subscribes. That is, for each subscriber, the actual Single that subscriber observes is determined by the factory function. The defer Observer allows you to defer or delay emitting value from a Single until such time as an Observer subscribes to the Single. This allows an Observer to easily obtain updates or a refreshed version of the sequence. T - the type of the items emitted by the Single. singleFactory - the Single factory function to invoke for each Observer that subscribes to the resulting Single. a Single whose Observers' subscriptions trigger an invocation of the given Single factory function. doOnUnsubscribe does not operate by default on a particular Scheduler. action - the action that gets called when this Single is unsubscribed. the source Single modified so as to call this Action when appropriate. action - an Action0 to be invoked when the source Single finishes. Returns a Single that mirrors the source Single, resubscribing to it if it calls onError (infinite retry count). If the source Single calls SingleSubscriber.onError(java.lang.Throwable), this method will resubscribe to the source Single rather than propagating the onError call. retry operates by default on the trampoline Scheduler. Returns a Single that mirrors the source Single, resubscribing to it if it calls onError up to a specified number of retries. If the source Single calls SingleSubscriber.onError(java.lang.Throwable), this method will resubscribe to the source Single for a maximum of count resubscriptions rather than propagating the onError call. Returns a Single that emits the same values as the source Single with the exception of an onError. 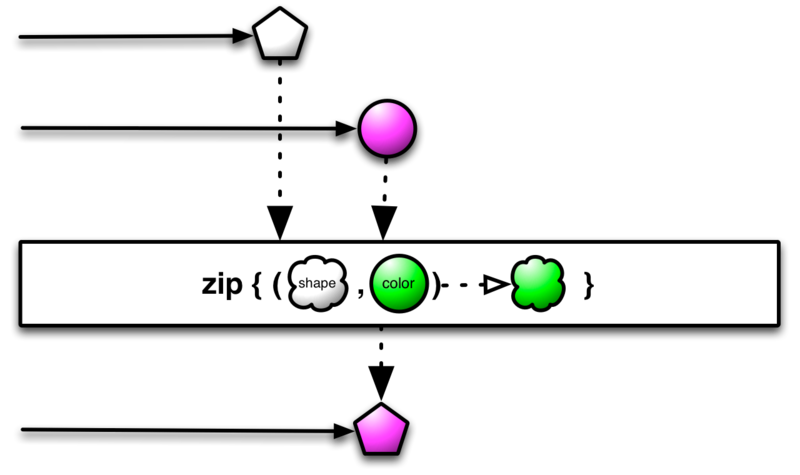 An onError notification from the source will result in the emission of a Throwable item to the Observable provided as an argument to the notificationHandler function. If the handler Observable emits an onCompleted the retryWhen will call onError with NoSuchElementException on the child subscription. If the handler Observable emits an onError the retryWhen will call onError with the same Throwable instance on the child subscription. Otherwise, the operator will resubscribe to the source Single. The notificationHandler function is called for each subscriber individually. This allows per-Subscriber state to be added to the error notification sequence. Note that you must compose over the input Observable provided in the function call because retryWhen(rx.functions.Func1<rx.Observable<? extends java.lang.Throwable>, ? extends rx.Observable<?>>) expects an emission of the exception to be matched by an event from the handler Observable. retryWhen operates by default on the trampoline Scheduler. Constructs a Single that creates a dependent resource object which is disposed of just before termination if you have set disposeEagerly to true and unsubscription does not occur before termination. Otherwise resource disposal will occur on unsubscription. Eager disposal is particularly appropriate for a synchronous Single that reuses resources. disposeAction will only be called once per subscription. disposeEagerly - if true then disposal will happen either on unsubscription or just before emission of a terminal event (onComplete or onError). Returns a Single that delays the subscription to this Single until the Observable completes. In case the onError of the supplied observer throws, the exception will be propagated to the downstream subscriber and will result in skipping the subscription of this Single. This method does not operate by default on a particular Scheduler. other - the Observable that should trigger the subscription to this Single. a Single that delays the subscription to this Single until the Observable emits an element or completes normally. The returned AssertableSubscriber consumes this Observable in an unbounded fashion.